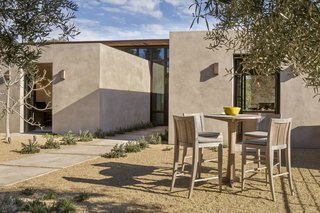 When a pair of empty nesters decided to trade San Francisco for a more rural refuge, they turned to Carmel–based practice Studio Schicketanz to bring their retirement home to life. 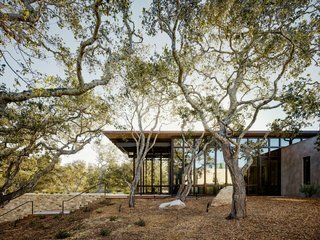 Set atop a cleared knoll punctuated with mature oaks, the home—known as Tehama 1—is grounded in crisp and clean modernism, yet also embraces its spectacular scenery with ample glazing and a natural material palette. Stone walls, made with rock excavated on site, frame the ascent with cement steps. 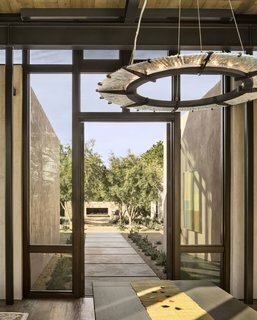 Spread out over 3,521 square feet, the single-story residence comprises a main dwelling and an adjacent guesthouse linked with a shared outdoor courtyard. 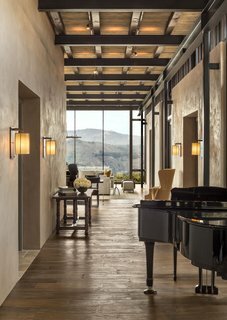 Textured stone walls and plaster—rustic contrasts to floor-to-ceiling glazing framed with metal—define the low-lying volumes. 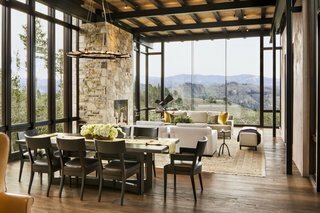 Full-height glazing ushers in incredible views of the hills to the south. "The home is organized into a 14-foot-high, rectangular, glass-and-wood volume which runs north/south at the edge of the forest and the more solid plaster cubes which penetrate the glass," explains Studio Schicketanz. 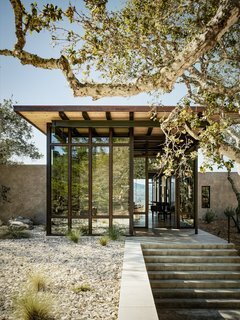 "While the all-glass entry and living areas are open to the surrounding nature, the plaster cubes offer intimate spaces to retreat to." The library, kitchen, and master suite are housed within the plaster cubes. The interiors continue the neutral and natural aesthetic with reclaimed teak floors, a fir ceiling, and a continuous connection with the landscape. The library overlooks the courtyard and the two guest bedrooms. 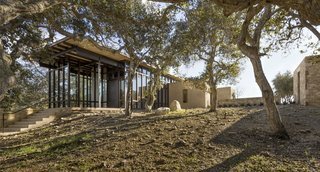 "The height differential allows for perfect cross ventilation on hot days while a large southern overhang assures protection from the sun during the summer and for the desired solar gain in the winter," adds the firm. The home was built atop a cleared knoll. A cantilevered roof mitigates solar heat gain. The entry sequence is lined with reclaimed teak flooring. The beamed ceiling is sheathed in fir. 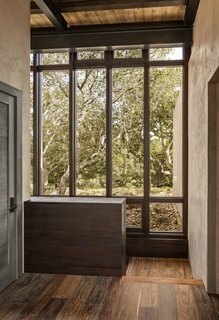 Natural light and outdoor views are invited in throughout the home. Modern bathroom fixtures are paired with rustic, natural materials. The master bath features a rounded, freestanding bath. The light-filled kitchen features custom cabinetry by a local millwork shop. 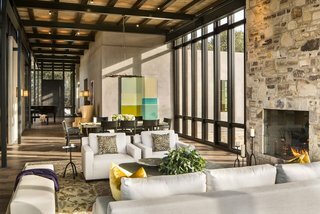 From the dining room, the owners look out towards the large stone fireplace framed by trees. 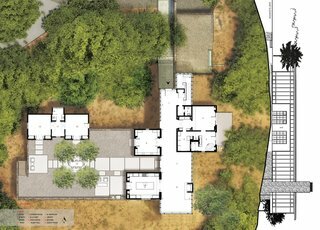 The existing driveway was rerouted to a lower elevation, and the garage was tucked underground so as not to detract from the surrounding views. 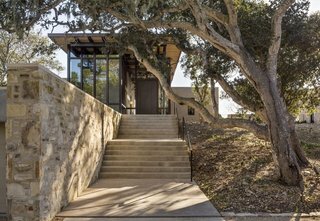 Architect of Record: Studio Schicketanz, Inc.